Electronic Kit School. - Maybe you think that to build car battery charger is difficult and need complex electronic circuit and component. But, it is really simple to build car battery charger with few component needed. You can only prepare transformer, 2 pcs diodes and a capacitor to build simple car battery charger look like shown in Figure 1 below. Add, you can provide resistor and LED to give the indicator if charger is worked. 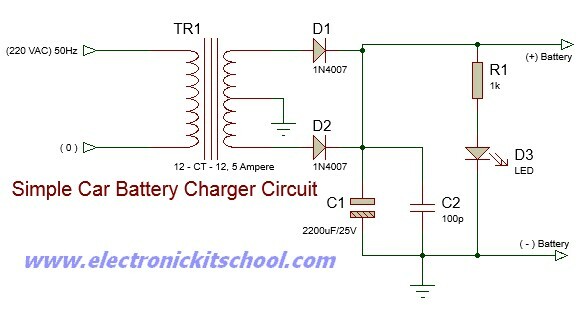 Circuit like in Figure 1 above show you about the Very Simple 12 VDC Car Battery Charger Circuit that can give you reference to build simple car battery charger. With using few component needed, now you can charge your car battery easily. In this circuit, transformer TR1 needed with 12 - CT - 12 with 5A is connected with 2 diodes 1N4007 served as rectifier. The capacitor C1 and C2 are used to make smoothing of rectification. You can release the capacitor C1 and C2 when the battery charged is itself acts a BIG capacitor. And the capacitors must needed when you are using the circuit to supply 12V (as a battery eliminator). Now the LED D3 will light when charge beginning and connected to the lead. R1 is used to save the LED from broken.